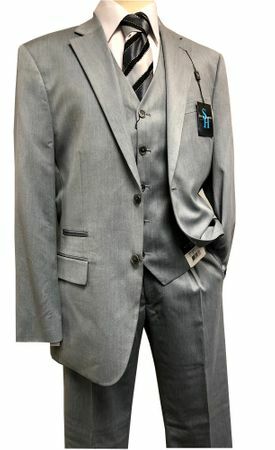 You'll go places dressed to impress when you wear this light gray sharkskin Steve Harvey 3 piece suit. That is because like their namesake, Steve Harvey brand 3 piece suits feature the style for the man who isn't afraid to express his sense of fashion. This light gray sharkskin 3 piece suit features that favorite shiny sharkskin fabric in a regular fit 3 piece suit that comes with pleated pants. The jacket on this Steve Harvey 3 piece suit has side vents, bold peaked lapels and those great looking french faced linings. Made of super 150s poly/rayon.